As gifts for sister on rakhi, you can select our flowers, sweets, cakes and chocolates. During any festival, especially a special one like Raksha Bandhan your actions speak louder than words. Want to show your loved ones how much you care? We can be of assistance! 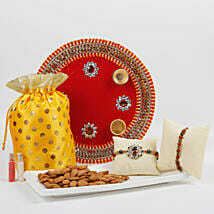 Look through our gifts and innovative thali designs to see what speaks to your preferences. We know how much the little details matter to you, which is why we have full variety on the design, colour and pattern of our gifts, rakhis and other items on the pooja thali. The best part? You can send these gifts anywere in the country! Send your especially chosen Rakhi Thali to Kochi. Do you miss your family and regret not being able to spend time with them on Raksha Bandhan? Don’t worry as you can get gift delivery to Kochi using our service. Don’t just passively watch the festival season come and go. Take some action! 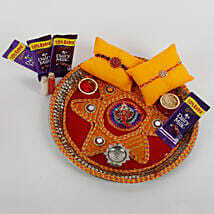 Visit our website and have a look at the vast array of gifts, rakhis and accoutrements needed for ceremonial worship. This is the most crucial part of the festival so give it some thought. With our amazing delivery system, you can send Rakhi Pooja Thali to Kochi. What is Raksha Bandhan without the beautiful ceremony of Rakhi and the ceremonial aarti, where the brother vows to protect his sister. Visit our website, order and ensure that you choose the best possible Rakhi and send gifts for your sister. Ensure timely Rakhi Pooja Thali Delivery in Kochi. To aid you more in the shopping process we have initiated facilities like free shipping, free home delivery, same day delivery, and midnight delivery.